Will Plentl retired in 2012 from his position as Deputy Aviation Director of the Charlotte-Douglas International Airport. It was a short retirement as within months he was elected president of the First Flight Foundation and began a “part-time” aviation consulting position with Parrish and Partners. Plentl’s tenure with the Foundation began in the early 1990’s when he served on the First Flight Centennial Committee then subsequently the First Flight Centennial Foundation (the previous name for the Foundation) charged with staging the “Event of the Century”, the 2003 First Flight Centennial December 17, 2003. After earning his B.S. in Civil Engineering from Virginia Military Institute, Plentyl began his aviation career as an Air Force Supervising Engineer at Wright-Patterson Air Force Base, OH. At Wright-Patterson, AFB he supported construction, research and development and worked on air force operations under systems command, airfield selection, and contingencies and supervised engineering and construction regarding Boeing and McDonnell Douglas. After leaving Wright-Patt, Plentl served as an aviation engineer for Florida’s Dept. of Transportation which prepared him for his career with North Carolina’s Dept. of Transportation-Aviation. With NCDOT-Aviation Plentl developed flight services; pioneered state construction standards for general aviation airport projects in NC and the southeast; and served over construction and facilities expansion. 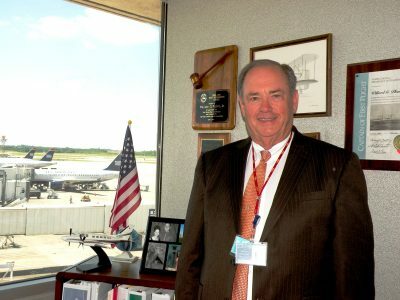 Throughout his 14 years with NCDOT-Aviation, Plentl developed and honed managerial expertise navigating state and federal bureaucracies for aviation transportation systems, block grants, and addressed business and tourism needs. He served as NC’s representative state-wide, nationally, and internationally for multiple aviation projects and initiatives. Plentl’s career as an airport director “took off” at New Hanover International Airport in Wilmington, NC. At New Hanover he increased hub options and brought one-stop connecting services to 141 domestic and 22 international markets. After leaving Wilmington, Plentl lead Charlotte-Douglas International Airport to both a world top five and top 10 ranking for operations. At Charlotte-Douglas he managed employee, customer, vendor, and carrier interests and programs. Plentl was an innovator for funding and revenue sources for security, development, facilities, improved communications, state-wide and federally with the FAA. For Plentl, two specific programs are noteworthy: the development of the CLT Center for multiple airport operational units and the establishment of a USO center at the airport. Plentl is a life member of the Air Force Association (AFA) and the NC National Guard Association (NCNGA). Professional associations include: National Association of State Aviation Officials (NASAO) serving as legislative chair and president; American Association of State and Highway Transportation Officials (AASHTO); National Society of Professional Engineers; and founding director and past president of the North Carolina Airport Association (NCAA). He is a life member and past president of the First Flight Society. Throughout his career Plentl has received numerous and prestigious awards: AASHTO President’s Modal Award; FAA National Appreciation Award; USAF Meritorious Service Award; NCANG Meritorious Service Award; CAP Friend of the Civil Air Patrol; NCAA President’s Award for Excellence, and NCDOT Captain of First Flight. He is a two time recipient of North Carolina’s highest honor, the Order of the Long Leaf Pine first awarded in 1992 by Governor Martin and in 1997 by Governor Hunt. He and his wife, Ann, divide their time between Raleigh and Davidson, NC.